There’s a joke among the Twitter community that if an anime or manga series wants to get a good review out of me, all they would have to do is include a catgirl character. I do not deny the fact that catgirls are my one and only weakness when it comes to anime. They tend to be my favorite character in any series, from Kizuna in Candidate for Goddess to Koboshi in Pita Ten. My love for this particular character type is the reason why my blog’s mascot is a catgirl herself. So when I popped in the two-disc UFO Ultramaiden Valkyrie OVA Collection into my video player, I was delighted to find out that not only was one of the main characters a catgirl, but she actually commanded an entire army of catgirls. So needless to say, I absolutely loved this series. The original UFO Ultramaiden Valkyrie started off with alien princess Valkyrie crashing into the bathhouse of the young Kazuto. She gives half of her soul to the boy so that she now lives her life with the body and mind of a small child, but turns into a fully matured woman when the two kiss. This OVA collection starts off after the second season of the anime. At this point, the two leads have established a clear and romantic relationship, and they are joined by the colorful cast of catgirls and alien princesses from the previous episodes. The six-episode “Season Three” of the series shows the months leading up to the marriage of Kazuto and Valkyrie while the two-episode “Season Four” focuses on what happens when the child Valkyrie lives side-by-side with her adult form. Ok, so maybe it’s not just the army of catgirls that got me so excited, but it is the prime example of why this show really stood out for me. 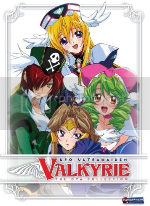 Valkyrie is a tongue-in-cheek comedy about the moé and harem series that have come out in recent years. However, it’s not a direct parody of the genre. There is a thin line between parody and tongue-in-cheek humor. A series like Lucky Star or Genshiken will purposely display the clichés of the moé genre for the sake of parody, but they will bluntly inform the audience beforehand that “this is meant to be a joke, so be sure to find it funny.” Valkyrie, however, has no such setup. It embraces the moé cliche like having a catgirl maid character, and then exaggerates the cliché by having her command an army of catgirl maids. Only then will they ever so slightly break the forth wall to let the audience know they’re not being serious about this. The way they break this forth wall is so wry and sarcastic that I often found it hard to believe that it was Japanese. While watching the dub, I’d often had to rewind the show a few seconds, switch the audio to the Japanese language, and verify that yes, that joke was in the original Japanese version. But the problem with this exaggerated humor is that the story appears to have the attention span of a hyperactive six-year-old. There are so many things coming at you in each episode that if you end up blinking at any point, you may miss some kind of new development. This could be so that the viewer would be getting “more bang for their buck” in buying the OVA discs, but it can be a little overwhelming at moments. I was also not happy with the way FUNimation released this OVA set. There are a total of eight episodes, but rather than evenly distributing it with four episode per disc, they squeezed all six episodes of Season Three onto its own disc while saving the lone two episodes of Season Four on the second disc. This was absolutely unnecessary as there was no difference between the two “seasons” other than their theme songs. I’d hate to think that video quality would have to suffer with having to squeeze so many episodes on a single disc. I remember watching the first season of this series when it was first released by ADV, and finding it not interesting enough to continue watching past a few episodes. However, I marathon’ed through these eight OVA episodes in one sitting and loved every minute of it. Asking around, it would appear that I’m not the only viewer who experienced this. Maybe they finally found their knack for the series after a couple of seasons, or maybe they could have just gotten away with better fanservice because it was an OVA. But in any case, you should still give this collection a shot even if you were not happy with the original Valkyrie TV series. The Good: Great wry humor mixed in with excellent fanservice. The Bad: Story gets a little A.D.D. from time to time. Episodes not evenly distributed on both discs. Final Verdict: The UFO Ultramaiden Valkyrie OVA Collection are eight episodes of hilarious tongue-in-cheek moé comedy. Even if you were disappointed with the original series, I recommend giving this collection another shot. This entry was posted on Wednesday, August 5th, 2009 at 9:32 am by Scott	.